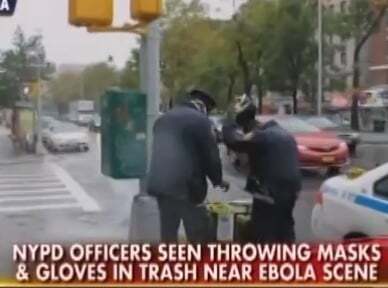 SHOCK VIDEO>>> NYC Police Seen Tossing Ebola Gloves, Masks into Trash Can on Street! Do not panic. All is well. New York City police officers were seen tossing their Ebola masks and gloves into a trash can on the street. The officers were seen walking near Dr. Craig Spencer’s apartment building.